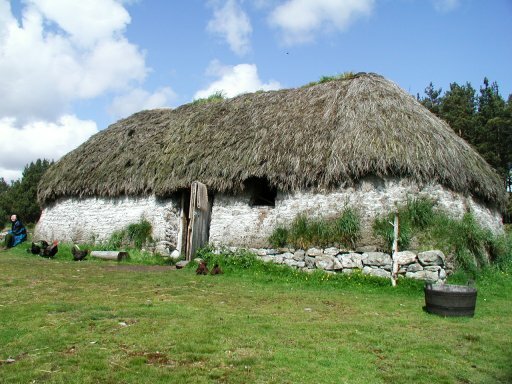 A typical highland family home from around 1700. Visiting Englishmen describe them as smoking dunghills. The ancestral home of Clan Davidson is in the Invernahaven area of Scotland at the confluence of the Spey and Tay Rivers. The Clan lived in this area till around 1400 and maybe even later. What was it like to live in those days and what was the average Clan Davidson home like? What was a clan home like? 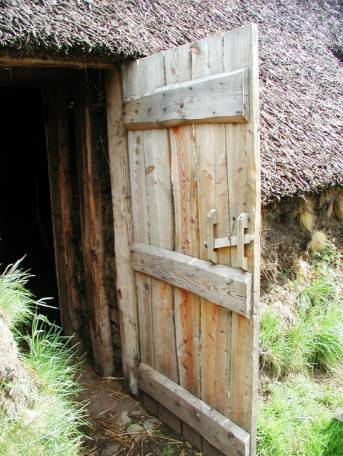 The average Clan Davidson member and his family lived in a small single family home, which were grouped into small villages or townships consisting of only a few families. Due to the sever winters in this area of Scotland, snows of 6 and 7 feet are not uncommon, the livestock was kept in the home during the worst part of the winter. The average house was divided into two areas. 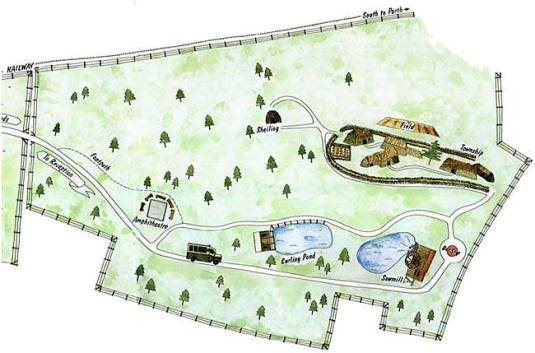 The first and lowest in elevation were the animal pens. The rest of the house was the living area with the center section serving as a living room, dining room, kitchen and bedroom in one small room. The other end of the house was reserved for storage of items during the winter and a very special box bed. There were no walls separating the areas just dividers, which were sometimes made out of wicker. Who and how were the homes built? The homes were built by the volunteer efforts of local clan members and put up in a couple of days. The materials used to construct the home had to be readily available since the highlands were so isolated and resources limited. The first stage of construction was a wooden frame made out of split wood. Because wood was scare in those days the wood used in the roof was considered very valuable. When families moved to a new area they would try to take the wood from the roof with them. During construction usually three or four A-Frames were first built out of large pieces of timber and raised. Cross-members of smaller diameter logs or branches were then used to complete the frame. A foundation of large boulders was built using locally made cement of mud and sand to hold them together. The walls averaged around 3 feet thick. The height of the stonewall varied from a single row to half way up the house. The height was due to the availability of large boulders and the means to move them. The rest of the wall was made from sod, which was cut in large blocks using special sod cutting tools. The walls were not further finished except to smooth over the inside with mud to cut down drafts. 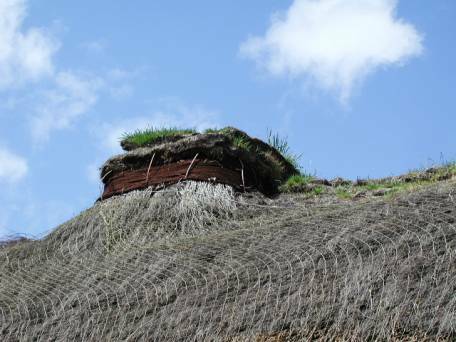 The roof was then covered with a layer tree branches followed by a thin layer of sod and finally covered with thatching material from a locally available dried grass. Generally no windows were put in and only one door. An opening in the roof was left for smoke from the fire to escape but was offset from the centrally located fire. The floors were of uneven dirt although wealthier families might put down some small homemade rugs in the family area. The house begins life as a wooden frame. Normally three or four main A-frames were raised then covered with smaller branches. 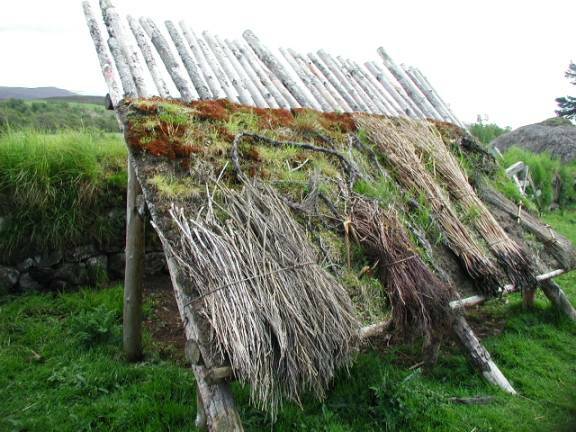 with thatching material from a locally available dried material like broom. There were normally no windows and only one door. A pull string secured the latch. fire to escape but was offset from the centrally located fire. What was living in one of these homes like ? Probably the most important part of the home was the fire, which was the center of life. The fire was constantly kept going and at night it was “banked” and only put out only on one occasion. That was when a disease struck their cattle, which was considered devastating to a cattle base economy. Since highlanders were very superstitious they thought that they should put out all the fires in the village and a special relighting ceremony would then be held. The hearth was a circle of stones laid out in roughly the center of the house. Peat was the only fuel used in these fires because it smolders and was more or less readily available. It served as a source of heat, light and cooking. Any other type of fuel like wood or grass tends to send off sparks and with a grass roof that is not a great idea. The disadvantage of using peat is it puts off a heavy smoke, which causes a cloud to be formed in the house with the only clear area close to the floor. Consequently all the chairs had very short legs unless you were a distinguished visitor when a higher chair was provided. Probably the most important part of the home was the fire, which was the center of life. A large kettle or grill was normally hanging over the fire with some type of food like gruel or porridge usually cooking. 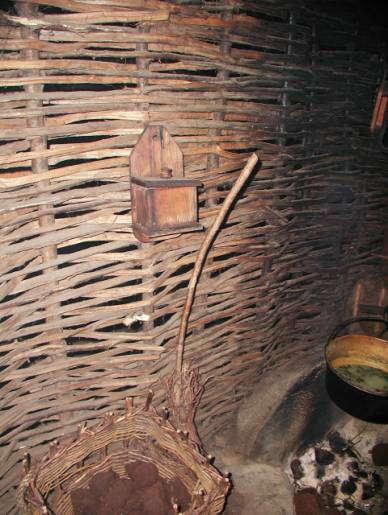 The chain, called the “slabhraidh”, that the cooking pot hung on was an important status symbol for the family. The heavier the chain the more wealthy the family was. There were no walls separating the areas just dividers, which were sometimes made out of wicker. The family’s diet generally consisted of gruel, porridge, fish (salmon) and any wild animals that could be hunted plus wild fruit and berries. During the winter when food supplies ran low the cattle that were being kept in the house were bleed and this blood was added to the porridge. This was a similar to present day blood pudding except the blood is not now taken from living animals. Potatoes were not even heard of since they were not introduced into Scotland until the early 1700’s. The domestic animals were only eaten as a last resort because they were too important to be slaughter for food. Basically the families and their livestock starved in the winter since they had no efficient way to store up food for it. When they did have some meat to eat it was usually very bad so they made heavy use of spices to flavor it. Items like salt to preserver food and these spices were considered luxury items and were very difficult to acquire. The milk collected from the cattle and sheep were churned to produce butter. 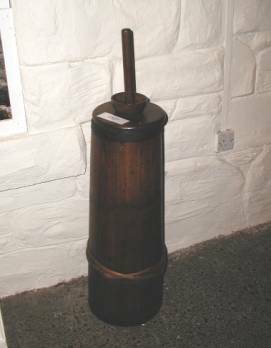 This churn is at the Kinguisse Highland Folk Museum. So how about those cute highland coos? The livestock consisted of highland coos, which were black and smaller than the present day highland cattle. 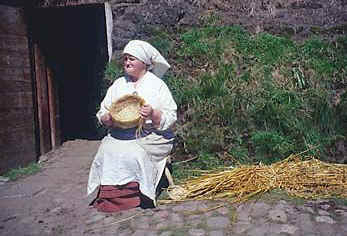 They served as the main source of income and measured wealth for the family and were usually only sold in the lowlands. 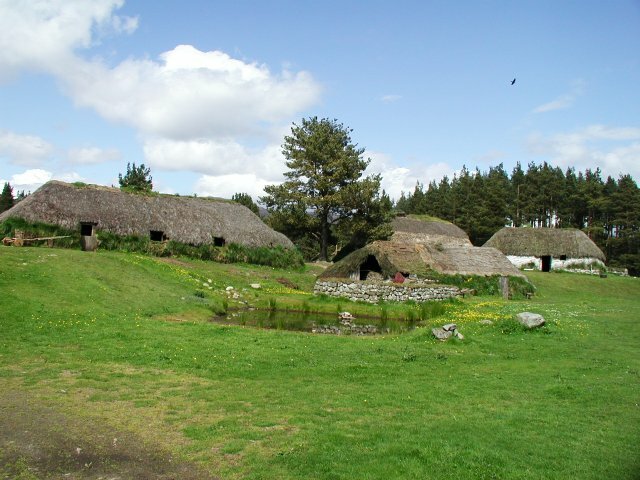 The highlands were considered a "Cattle Economy" and a "Warrior Society". The term ‘Black Mail” actually came from these important beasties. The word “Black” comes from the color of these cattle and “Mail” used to mean pay. The sheep that were kept were as small as dogs and provided only had a limited amount of wool and milk. The larger sheep seen today were not introduced until the “Highland Clearances” began in the later 1700’s. Chickens were kept for their eggs and once in a while were put in the pot. 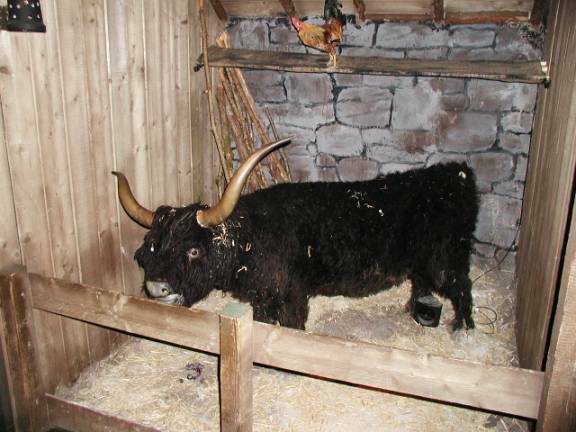 The livestock were kept in the house during the winter because they could not survive outside. The stuffed coo is at the Rob Roy Museum in Callander. 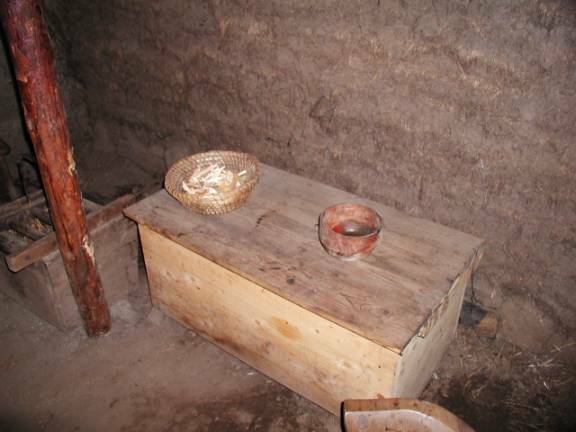 The livestock were kept in the house during the winter because they could not survive outside. Also they provided an extra source of warmth plus the blood. There was very little feed available for the cattle and once brought into the home they would stay until spring. Because of the lack of feed they would get very thin and weak and would have to be carried out in the spring. 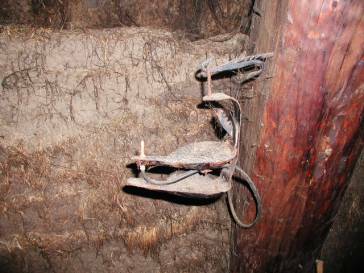 A trough was dug in the floor to allow the cattle’s waste to be carried off using gravity. This was why the animal pens was the lowest part of the house. The family also used this area to relieve themselves since they had no other restroom. The family did not bath very often and may have been no more than once a year. Their clothing was left on and almost never removed except when it was time to replace it with new clothing. This plus the live-in livestock and constant heavy black smoke from the peat fires must have made these homes smell rather strong. Englishmen visiting the highlands often remarked that these houses look like smoking dunghills and they probably smelled that bad too. Wool was the primary source of clothing and spinning was considered woman’s work. The wool was gathered from the sheep and spun using either a spinning wheel or if the family was really poor then only a spindle. Once the wool thread had been made it was given to a weaver in the village to turn it into wool cloth for clothes. Local dies were used to give the wool different colors including having the women providing special dies using their waste, which was kept, in a special pot. 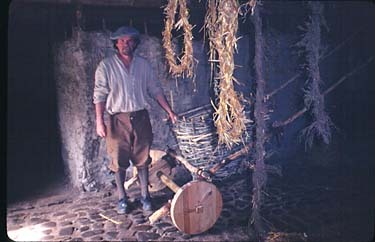 This is an example of a Saxonie Spinning Wheel, which is still common in the highlands. 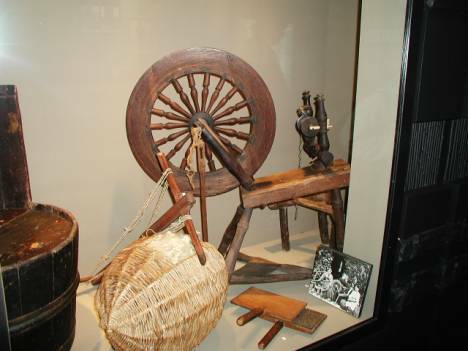 This spinning wheel is in the Dingwall Museum. What were the furnishings like? The box beds were the only means of privacy in these homes. They usually had either doors or a curtain to pull over the front. Several people would sleep in the beds head to foot to keep warm. The special box bed in the end room was unusual in that it was only used on three special occasions: the marriage night, when giving birth, and to lie out the dead before burial. All the family activities took place around the fire and since they had no tables the meals were eaten on their laps. 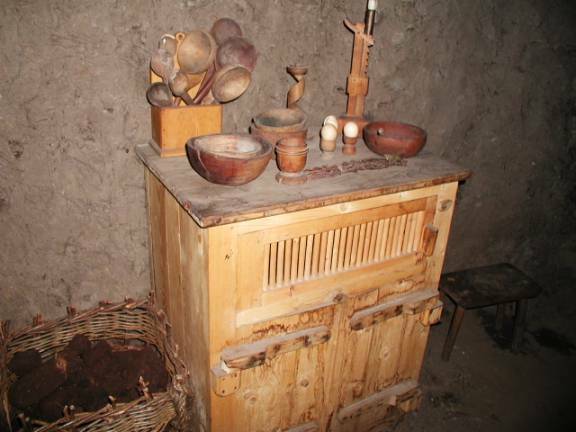 The highlander’s were not skilled in making pottery so most of their dishware and utensils were made from wood. visitor when a higher chair was provided. provided supplemental lighting. Candles were not used till much later. 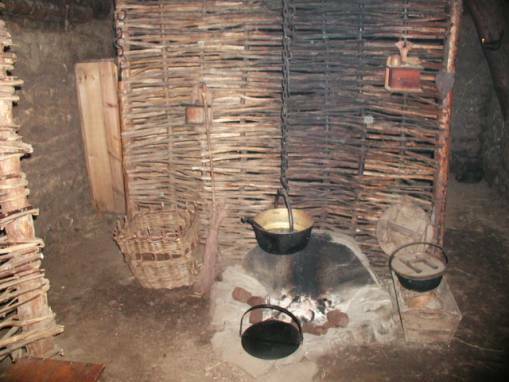 The highlander’s were not skilled in making pottery so most of their dishware and utensils were made from wood. Since they did not have refrigerators they kept their food in a small cupboard. The slated top section was for meat. which also served as a table. The box beds were the only means of privacy in these homes. They usually had either doors or a curtain to pull over the front. Several people would sleep in the beds head to foot to keep warm. 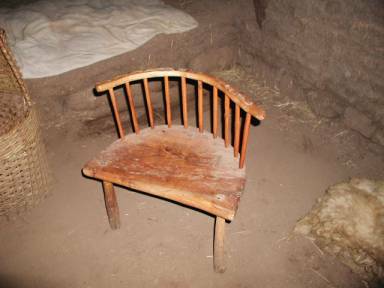 The bed consisted of a linen mattress filled with straw. The special box bed in the end room was unusual in that it was only used on three special occasions: the marriage night, when giving birth, and to lie out the dead before burial. Today on the outside of the little central highland town of Newtonmore, which is very close to where the now almost forgotten area of Invernahaven once was there is the Highland Folk Museum. 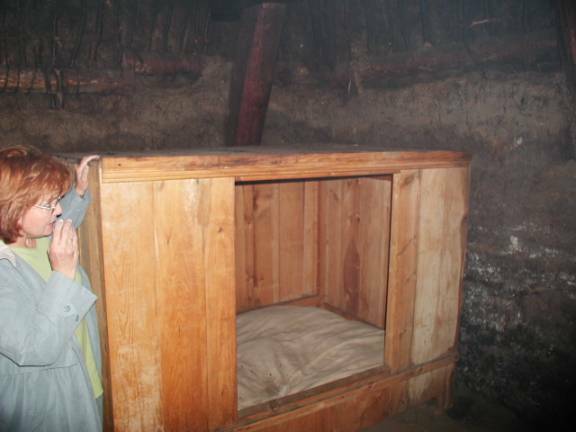 This living museum has been built showing how the inhabitants of this area lived through the ages. The oldest section of the museum deals with the small township of Baile Gean, which has been rebuilt based on an archeological dig close by. This village was occupied up until around 1700. If you get a chance please visit this wonderful living museum. The staff dresses in traditional clothes and will give you a very interesting description of how it was to live in the highlands. Additionally, there are also several books listed below which furnish further information. The Baile Gean township at the Highland Folk Museum at Newtonmore where most of the information was obtained. 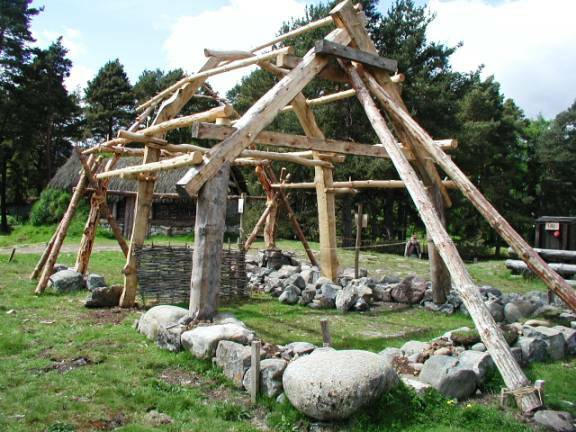 The Highland Folk Museum, Kingussie and Newtonmore, invites you to enter the World of the Highlander - to see, touch, smell and feel the atmosphere as you walk through the material remains of 400 years of Highland life from clansman to crofter. 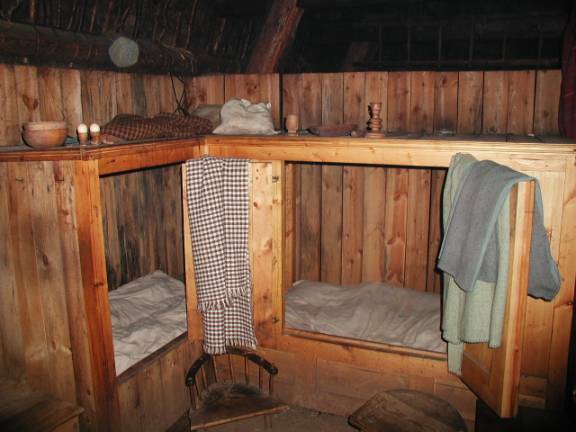 Track how Highland people dealt with their environment, creating ingenious solutions to their everyday problems of providing light, heat, shelter, clothing and food. Applying the traditional skills and crafts, researching and reconstructing a series of 'time windows' in a larger environment. At Newtonmore, whole buildings and their environment have been lovingly and painstakingly reconstructed, according to the authentic skills and technology of each period. The traditional skills and crafts glimpsed at Kingussie can be seen being applied at Newtonmore to fashion objects, buildings and a way of life. Here you actually enter the World of the Highlander and experience walking through a number of 'time windows' dating from the early 18th century Highland township to the mid-20th century working croft. 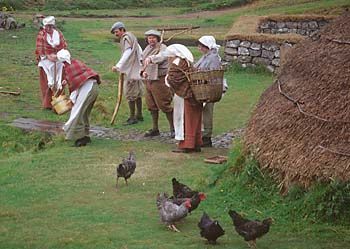 This site encapsulates human endeavour and development in Highland life..
Visit the Highland Folk Museum here!